A blue plaque has been installed at 4 Berkeley Crescent – what is perhaps Bristol’s shortest crescent (above) – to commemorate the architect John Dando Sedding. Born at Eton in 1838, he spent his early years in Derbyshire and then lived in Cornwall, briefly in Bristol and finally London. Sedding made his reputation as a church architect, with an interest in a ‘crafted Gothic’ style. Initially, he excelled at additions and restorations which he carried out in many small parish churches in the West Country. In London his churches include the highly-regarded Holy Trinity, Belgravia which offers a rich mix of styles: late-Perpendicular Gothic, Byzantine, Second Pointed tracery, Renaissance, Art Nouveau, and Arts and Crafts. It reveals the influence of John Ruskin and William Morris, both of whom he knew. St Saviour’s House, St Agnes Avenue, Knowle, Bristol BS4 2DU. His time in Bristol was brief and there is only one building attributed to him here (on the left). But it is a well-concealed jewel, and worth seeking out. St Agnes Avenue, Knowle, close to the summit of Redcatch Road has a high-walled, leafy stretch with wonderful views across the city. Step into the drive between pillars and enjoy a delightful façade – tile-hung and half-timbered gables, leaded casements, projecting wings and porch, cornices, crenellations and corbels – it has everything! 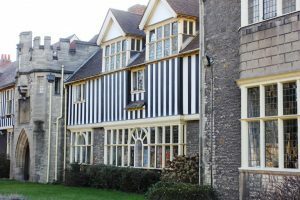 Nowadays it’s St Saviour’s House, a retreat where residents can attend Traditional Latin Mass in the chapel. Sedding designed it as the Industrial School – an orphanage, St Agnes, home for 40 girls destined for domestic service or nursing. It has also been the Convent of the Sisters of Charity.